There are a number of processes that need to run in order for Kite to function properly. This is the main Kite process. It is responsible for performing all the code analysis and also manages displaying the menubar icon. This is the Copilot UI that ships with Kite. It will not work unless the Kite Engine is running. You can exit out of the Copilot any time and reopen it using the menu bar icon. This is a process that runs only at startup to ensure that Kite is updated. This is the main Kite process. It is responsible for performing all the code analysis and also manages displaying the menubar (system tray) icon. This is the Copilot UI that ships with Kite. It will not work unless kited.exe is running. You can exit out of the Copilot any time and reopen it using the system tray icon. 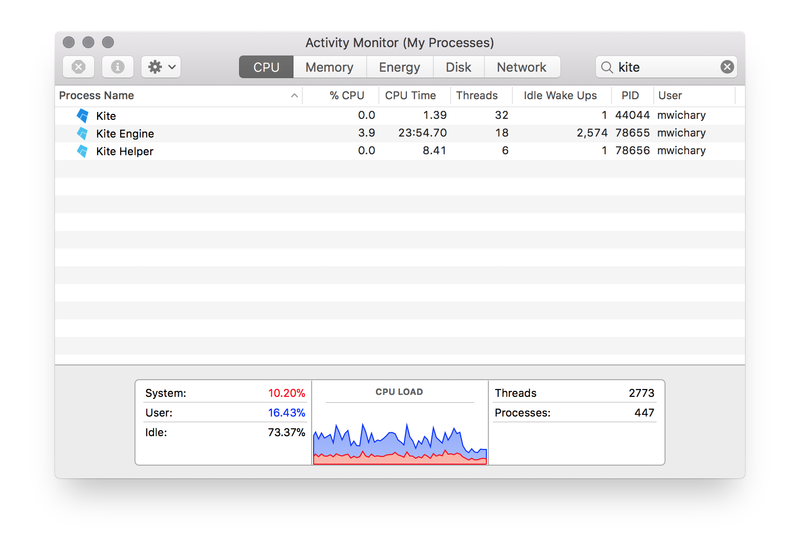 Note: The Copilot is powered by Electron, which spawns multiple processes. That is why there are multiple processes with this name. This is a process that ensures that Kite is updated.